Even though elite closer Craig Kimbrel is still a free agent, most teams already have a pretty good idea of how their bullpens will shape up in 2019. We’ll begin our division-by-division review with the NL East. On the whole, it’s a middling division headlined by the deepest relief corps in baseball, a trio of teams with quality closers, and one club that hasn’t even bothered trying to build a bullpen. For a high-level look at all 30 teams, take a peek at our All Bullpen Audit. I welcome any and all criticism or suggestions. Think I missed somebody? Feel free to reach out to me on Twitter @BaseballATeam. This is likely the third-best bullpen in the league, topped only by the Yankees and Brewers units. What the Phillies lack in truly elite talent, they make up for in depth of closer-capable relievers. They will carry eight relievers to make better use of this stockpile. Without trades or injury, Ramos and Arano will begin the season in Triple-A. They would both be the top reliever on the Royals, Marlins, Orioles, Tigers, and Mariners. Adam Morgan, a serviceable left-handed pitcher, is out of options and behind Alvarez and Pazos on the depth chart. If all six of their starting pitchers survive Spring Training, the club may want to carry Jerad Eickhoff or Zach Eflin as a long reliever. And this talk of depth completely ignores a cresting wave of minor leaguers, some of whom could arrive in a manner similar to Dominguez. The ninth inning will likely be shared by Robertson, Dominguez, and Neris with a few others stepping in on occasion. Assuming Gabe Kapler retains his job, we can anticipate the Phillies to eschew a traditional closer. Robertson will probably finish the most games with Dominguez working multi-inning saves. Before you count out Neris due to his 5.11 ERA last season, it’s worth noting that he led the league in swinging strike rate. A slump from late-May through late-June accounted for most of the damage. As I’ve warned for years, Neris has a tendency to lose command of his elite splitter for several weeks at a time. When he’s on, opponents often look helpless. In Alvarez and Pazos, the Phillies appear to have acquired two southpaws who can also handle right-handed hitters. It’s expected that the club will try to trade one or more of Hunter, Neshek, and Nicasio. They can afford to eat the entirety of their salaries in order to improve the return. The Rays appear to be the most obvious trade partner. The Mets bullpen has an incomplete feel to it. The club may try to use the final two spots to develop new talent. It’s also possible they’ll get involved for buy-low veterans like Ryan Madson, Bud Norris, and Sergio Romo. Diaz was the prize of Brodie Van Wagenen’s winter wheeling and dealing. The top closer of the 2018 season figures to be used in a highly traditional manner. He’s set up by a familiar face to Mets fans. Familia is a closer-quality reliever in his own right. By comparison, Lugo and Gsellman are merely good. They can flexibly handle a variety of roles from spot starts all the way to competent high leverage appearances. Both could record over 15 holds, although you shouldn’t expect premium ERA or WHIP. In holds leagues, roster Wilson instead of Lugo or Gsellman. He’ll likely post stronger ratios and more holds as the primary lefty specialist. Some scouts think Rule 5 pick Kyle Dowdy could see his stuff play up as a reliever. The Mets will hope for a similar outcome with former Padre Walker Lockett. Daniel Zamora is a left-handed specialist who leans heavily on his slider. Non-roster invitees Luis Avilan and Hector Santiago could also earn roles as left-handed specialists. Santiago doubles as a long reliever. Like the Mets, the Braves bullpen depth fizzles after their top five names. Unlike their New York rivals, Atlanta has a deep pool of pitching prospects to call upon. This is a bullpen I fully expect to be fortified by a former starter converting to high leverage relief. As to which player that will be, we’ll have to wait for Spring Training and perhaps the early portion of the minor league calendar to play out. The closer role is by no means guaranteed to Vizcaino. The hard-throwing righty has only once thrown over 40 innings in a major league season. Never has he reached a 60-inning workload. Injuries frequently wipe out a chunk of his campaign. By comparison, Minter completed 61.1 innings in 2018. His simplistic fastball-cutter repertoire is highly effective. I recommend stashing him – he’ll eventually earn a share of the saves. At times, Winkler looked like a potential closer candidate too. Atlanta learned to hide him from left-handed hitters. They batted .286/.385/.506 against him. Righties hit a meager .192/.253/.248. He’ll probably continue to be used as a ROOGY, making him a viable reliever in holds leagues. O’Day, if healthy, is also a steady late-innings presence. Venters is in the mix as a left-handed specialist while Biddle is more of a low-leverage, full inning southpaw. Hard throwers Freeman, Shane Carle, Luke Jackson, and Chad Sobotka will all battle for spots. Keep an eye on this group as they all have the raw potential to add a new trick and leap into a high leverage role. Also watch out for starters like Max Fried, Luiz Gohara, Touki Toussaint, Kolby Allard, and Bryse Wilson to name a few. Fried in particular looks ripe for a switch to relief. 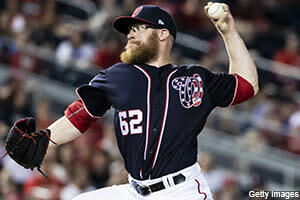 It’s easy to see potential in this Nationals bullpen. When healthy, Doolittle is an easy top 10 closer. His only issue is staying on the field for a full season. Barraclough and Rosenthal are troubled former closers. Their outcomes have ranged from at-times dominant to severely lacking in quality. Barraclough in particular struggles with command on a regular basis. Rosenthal sometimes suffers from the same defect. My biggest worry with Rosenthal is that his previously elite fastball will no longer be enough to stymie opponents. Hitters are far more used to 98 miles per hour heat than during Rosenthal’s best years. Glover is perhaps the filthiest bad pitcher in the league. His cutter is visually impressive, although the results are merely good. He should retire his 95 miles per hour fastball altogether. Or at the very least greatly increase his cutter usage. Miller had a surprisingly successful 2018 campaign. He faded late in the season. Of the two left-handed options, Grace is the more reliably solid reliever. Solis hasn’t experienced major league success since 2016. One guy to keep tabs on is Trevor Gott. Formerly considered a closer-in-waiting back in 2015, Gott has since shown no special ability with retiring major league hitters. The losers of the rotation battle between Joe Ross, Erick Fedde, and Vidal Nuno could land in the ‘pen. The Nationals have yet to announce any non-roster invitees, although a few veteran relievers will probably show up in camp. The Marlins figure to cycle through quite a few relievers this season. As the veterans of the unit, Steckenrider and Conley are the best bets to land saves. Steckenrider regressed in 2018 after a strong 2017 debut. Even though he replaced his slider with a more effective, harder variety, it wasn’t enough to maintain above average results. Expect around 10.5 K/9 with a sub-4.00 ERA and comparably unimpressive WHIP. I have bigger hopes for Conley. He could increase his changeup and slider usage to increase his strikeout rate. As a starter in 2017, he averaged only 89.5 miles per hour. After transitioning to relief, his fastball spiked to 95.3 miles per hour. At times, Guerrero looked like he’d leap to the top of the Marlins bullpen. His signature is a 98.8 miles per hour fastball. A lack of command and an overreliance on the pitch left him overexposed. It’s possible the 28-year-old will improve in his sophomore campaign. Sticking with a common profile in Miami, Kinley features velocity, poor command, and disappointing results. Ferrell, a Rule 5 pick, fits this profile too. The hope is they eventually learn to hit spots. Jarlin Garcia could serve as a long reliever or lefty specialist. Merandy Gonzalez, Elieser Hernandez, Austin Brice, and non-roster invitee Hector Noesi are also in the mix for spots. None figure to possess fantasy potential barring an unexpected breakout.